Founded in 1880 by Benjamin E. Lower, John Wesley and wife, first settlers. Lower became the first postmaster, 1880; Mrs. Wesley was second, 1882. 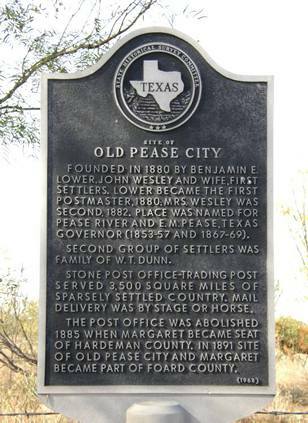 Place was named for Pease River and E. M. Pease, Texas Governor (1853-57 and 1867-69). Second group of settlers was family of W. T. Dunn. Stone post office-trading post served 3,500 square miles of sparsely settled country. Mail delivery was by stage or horse. The post office was abolished 1885 when Margaret became seat of Hardeman County. In 1891 site of Old Pease City and Margaret became part of Foard County.